As craft beer grows and develops, the craft industry is working hard to innovate new products to meet the demand of the increasingly sophisticated consumer. When craft found its place alongside big beer, differentiating oneself from the bland industrial post-prohibition guys was a fairly straight-forward proposition. If you brewed literally anything but a low gravity pale American lager, the flavor palate of the typical US beer drinker was challenged in new and exciting ways. It wasn't always an easy sell, but it started a revolution. As brewers became more and more daring, craft industry folks learned pretty quickly that US craft consumers had a yet-to-be scratched itch for hops: More hops, new hops, late hops, dry hops funky, funky dank hops. Though craft has ushered a ton of new and different styles to the craft enthusiast's fridge, IPA has taken center stage in the craft revolution and the demand for new, exciting and innovative IPAs has lead to increased hop acreage, experimental hop breeding and hop product development. IPAs are an expensive proposition for a brewer. Hops are expensive. They are a big time commodity. Brewers contract years at a time and it can get pretty competitive. Furthermore, all those hops in the kettle and fermenter also have a drastic impact on a brewery's yield. Hops are essentially a dried plant material and as a result are very absorbent. 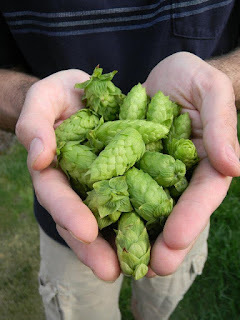 Whole hop cones, like those used by Deschutes and Sierra Nevada, can soak up a substantial amount of beer. This is especially true when heavy dry hopping is employed. There is a benefit to using hop pellets (pulverized and pelletized from the whole cone) in terms of utilization and yield. But these can also form a thick, unusable sludge that robs precious volume from the finished beer. As a result, breweries seek ways to reduce the volume loss while maintaining, or even improving, the hop character of their beer. Some very cool products are hitting the market and we sought to test out three of the newest innovations in amping up the hop character in beer. The mission: To brew a killer IPA using the newest in hop innovation. Yakima Chief planted the seed (or was it a rhizome?) in my mind when they began marketing their CryoHops LupuLN2 Lupulin powder. I was able to get my hands on some Citra LupuLN2 and in considering some uses, I began to conceive beer that is completely absent any traditional hop products. No pellets, no cones, a lot of science. I then reached out to the people at Crosby Hops, with whom we've maintained a great relationship through the years. They are always there for me as a homebrewer with my annual pellet order and they were huge in the Growing Local Beer series in 2015. Crosby Hops have been marketing a product called HopHash, which they only currently make available to their commercial accounts (Check out their collaborations with SweetWater and Caldera). To help with our project, they were kind enough to provide us with a sample of Centennial HopHash. Those two products are ideally suited to add late in the brewing process, either in a whirlpool addition or as dry hops in the fermenter. With flavor and aroma covered, we now needed something to add early in the boil to bitter our IPA. I'd done some reading on CO2 extracts recently and reached out to the folks at Yakima Valley Hops, whom I'd met in March at the PNWHC. They sell CO2 hop extract on their site and I was able to get some for this project. With all the key components in place, it was time to plan the recipe. I have a couple of IPA grain bills I use for different beers. The goal of each is to add a nice, flavorful baseline that will not impinge on the hop showcase. Keep it simple and try to create a nice, fermentable wort. There are only three malts in this beer and they have a very specific role. The base malt is Great Western Two Row. It is one of the most widely distributed and easily available grains on the market. It is a solid base malt that does little to get in the way of the character malts, yeast or hops. We are using an additional base malt in this beer in a very small amount. A well-known trick for head retention is to add White Wheat Malt as between 5-10% of the grain bill. Because this beer will have very little vegetative matter from the hops, head retention is a concern of mine. That hop material goes a long way to creating the big, fluffy head on your favorite IPA. We are cutting most of that material out using our cool new toys, so I wanted to add some wheat malt to provide some proteins to add to the head retention. Finally, the sole character malt in the bill is a bit of a controversial topic: Crystal Malt. A recent trend in IPA brewing is to cut most if not all crystal malt from IPA grist. The result are dry pilsner-like IPAs that are very, very pale. The IPAs of old were darker, more robust and featured a caramel-like influence from crystal malt. An abundance of crystal malt is said to interact in a way with late hop additions in a way that can produce a cloying sweetness that makes for a less-pleasant hop experience. I come down somewhere in the middle of the argument here. I brew a ton of Pilsner. I probably brew 50 gallons of the stuff per year for home use. When I want to brew something different, I want it to be different. But I am also aware that we are brewing an IPA here, not an Red Ale. I added about 5% Crystal 60L (UK) to this beer for color, body and a little residual sweetness. I wanted a little color in this IPA. Something a leaning toward gold, not quite to copper. Which is actually near bottom of the style guideline. Oh and one more thing, there is one pound of cane sugar in the kettle for the purpose of boosting fermentablity and drying out the beer. Hard water rules the IPA scene. IPA water is typically high in Sulfate and low in alkalinity. I acidified my water to lower the mash pH, neutralizing the alkalinity. I then added Gypsum and Calcium Chloride in a ratio of 3:1 to add a high Sulfate to Chloride ratio which brightens the crisp hop character. Because I was brewing 10 gallons of this beer, I thought it would be fun to tinker with two very different, but well-suited, IPA yeasts. Both came from Imperial Organic Yeast. Five gallons of the beer got my standard A01 - House yeast. It is a clean, neutral and highly flocculant yeast. I love it and I used it often. The second 5 gallons got a special blend of hazy IPA yeasts designed by Imperial for Bader Beer and Wine Supply. It contains Barbarian, Citrus and Juice strains resulting in a more dank, funky and hazy IPA. I am curious to see how this one plays out. It will be cool to see how the two strains differ from one another and how they play off the hop flavors and aromas in the beer. Time to get serious in our descriptions of these products because they are all unique and all serve a very dedicated purpose in the project. CO2 extract is something that has been available to the big, industrial breweries for a while now. As much as I may hate to admit it, those big guys pioneer a lot of tech that trickles down to the craft scene. It's all a matter of how you use it. For the big guys, it is all about maximizing the efficiency in their staple beers. For craft guys, this is a fun and exciting product that can be used to create some fun and interesting beers...and that improved efficiency is a HUGE help too. Some oils based beers out there right now are Lagunitas - Hop Stoopid and Sunriver Rippin. Both have HUGE hop character and rely on extracts in the kettle heavily. The product is derived from whole high alpha acid hops, extracted under CO2 to create a sticky hop resin that is truly potent. A pellet or cone of something like Columbus hops will typically comes in at 14% Alpha Acid, a hop with some true bittering potential. This extract is derived from Columbus and come in at 60% Alpha (SIXTY!!!). If anything in this beer resembles a traditional hop product, it is the hop hash. Hop pellets are created in hammer mills which pulverize hop cones into dust and compact the powder tightly to reduce oxidation to the product, and increase surface-area contact in the kettle and fermenter. The goal is to pelletize freshly dried hops at a low temperature to preserve the volatile oils in the lupulin glands of the cone. In my experience, Crosby Hop Farm does this better than anyone I've seen. They pelletize on the farm and do so at a very low temperature and store cold under nitrogen immediately. Their hop pellets always come to me so thick and wet with hop oils it is ridiculous. One very cool thing about Crosby Hop Farm is their commitment to sustainability. They are a Certified B corporation and waste is always on their mind. In the pelletizing process, resinous material collects in the mill and on the belts that feed it. This material is dank with those coveted resins and oils and low in vegetative material. This is Hop Hash and it is amazing to behold. I have to say Centennial is the product that really sets CHF apart from everyone else. Russian River uses their Centennial in Pliny the Elder and that is a very strong endorsement. I am lucky enough to have been in the pellet room during Centennial processing at CHF two years ago and will remember that smell for the rest of my life. I smelled it again when I opened the bag of Hop Hash for this project. There really is no closer thing to standing in the room with a truckload of freshly kilned hops than this. To quote the greatest living American actor, "Here comes the science". This stuff is so advanced, I needed to do a lot of reading to even understand what YCH was sending me. As previously mentioned, the lupulin is the good stuff. Lupulin holds those delicious oils and the bittering component (Alpha Acids). All the rest is veggie matter and in creating Cryohops, YCH sought to separate the two. The result are two sister products LupuLN2 (Lupilin Powder) and Debittered Leaf (a low alpha product that is mostly the remaining plant matter). The Citra LupuLN2 that YCH was kind enough to send me is as you would expect, a powder. The Citra aroma was brisk and fresh. It resembled Hop Hash, but was lighter and fluffier. Despite all the new-fangled hop products we are using, this is a pretty straight forward beer to brew. 60 minute single-infusion mash of the grains in my cooler mash tun at 150f went off without a hitch. I recirculated for 15 min to lauter the grain then sparged. Easy Peezy. The boil was fairly straightforward too. I added the CO2 extract as the beer reached the hot break and boiled for 60 minutes. I did add my chiller, nutrient and whirlfloc (a clarifier) at 10 minutes as well and began to recirculate the boiling wort with my pump to sanitize the pump and tubing.. However, none of the Hash or CryoHops were added to the boil itself. Once the full 60 minute boil was achieved, I added .5 oz of the Citra CryoHops and 1.5oz of Centennial HopHash and circulated for 15 minutes, before repeating those additions for a second 15 minute whirlpool. The aroma was amazing. One very interesting thing came during hop additions, when I needed to sanitize a spoon and stir the CryoHops product into the wort. The stuff is downright hydrophobic owing to it's high oil content and light weight. It was content to rest on the surface of my wort until worked it in. I then chilled my wort to 64f and moved the beer to 2 sanitized 6 gallon glass carboys. I oxygenated the wort with pure O2 for 60 seconds each and pitched my yeast. I am a big Imperial Yeast fan and have made the switch to their products almost entirely. They provide an enormous pitch of yeast in each can and I've had nothing but success with their products. Now, I normally do a small starter just to get the yeasties up and running before brew day, but this time, I am relying on Imperial's "Pitch Right" claim and pitching each can, cold into the respective carboy. I pulled samples and saw I had achieved a starting gravity around 1.062. Right on target. I moved the carboys to my fermentation fridge without dropping either one on the garage floor (a story for another time) and applied my temperature controls which consist of 2 Fermwrap heaters attached to 2 Inkbird temperature controllers with probes immersed in the beer via thermowells. This allows me to bracket the fermentation temperature between the cold air of my fridge and the slow, even heat of the fermwraps to +/-1f precision. I set the controllers to 65f and went to bed, leaving all that mess in my garage for the morning. A practice my wife just loves. The beer experienced a brief 18-24hr lag time before visible signs of fermentation, which is pretty typical. When I went to bed Sunday night around 10pm, I could see some krausen forming and prepped my blow off tubes for the following morning. I had a feeling these fermentations would take off pretty violently through the night. Sure enough, Monday AM, when I woke up at 4:30 for work, the fermentations were in full swing, sending yeast through the airlocks (and some on to the ceiling of my fridge). I set up the blowoff tubes and waited for signs that fermentation would slow over the next few days. As krausen begins to subside, I dial up the fermentation temperature 2f/day until 72f is attained. The purpose here is to keep the yeast happy and active as the fermentation slows, allowing them to clean up any off flavors and reach terminal gravity with full attenuation. On Day 5, I noticed the krausen had begun to subside and I pulled a sample for gravity. The beer was at 1.010, a good target gravity for a clean, dry IPA at about 6.8% ABV. The following day, I introduced our dry hops. I will sometimes move the beer to a CO2 purged secondary fermenter for dry hops if I am hoping to preserve the yeast. In this case, I am trying to minimize oxygen exposure and will be skipping any additional transfers. So dry hops in the primary it is. I've been warned by both YCH and CHF about the hydrophobic nature of their products. I will say both products did try to pile up on the surface, however one of the advantages most homebrewers have over the pros is our small batch size. I was able to gently rock the fermenters and get the hop products to integrate into the beer. I'd like to see some of the pros rock a 15bbl fermenter. The more I drink this beer, the more I like it. I think that is how it is supposed to be. It is something that is a bit of a dying breed: A Balanced IPA. The hop character is crisp and fresh, the malt backbone isn't substantial but balances the flavor profile well. Head retention is completely out of control. Just beautiful in the way it laces down the inside of the glass. A very non-traditional approach yielded a very traditional American IPA. The bittering of the beer is on point, and the late hop additions are clean and clear. The Bader Blend version of the beer added a little juicy citrus note to the fermentation profile that really kicked up the fruity hop character. I prefer it slightly to the House yeast version. I shared this beer around the neighborhood and with beer friends and had positive feedback on the drinkability. Though it's not a complete and total hop bomb, it was very drinkable and several returns to the kegerator are usually in order. I would like to try this experiment again with a more pale. dry beer just for fun. The balanced beer is a good one, but in summer, I may just repeat the process with a more pale beer. That could be dangerous on a hot day! A big thank you goes to Crosby Hop Farm, Yakima Chief Hops and Yakima Valley Hops who were all very generous in their participation. Thanks for the big assist and your continued support of #pdxbeergeeks. Wow, what a weekend! For the second straight year, the Pacific Northwest Homebrewer’s Conference was a tremendous success. From the knowledge shared during the seminars, to the product demonstrations from sponsor vendors, to the keynote speeches, and even the casual discussion between participants, the event was a blast to attend. And then there was the beer... oh God the beer. The event kicked off Friday with registration, seminars, dinner and Pro Night. Getting things rolling, some of the topics included Oregon Brew Crew member Alex Brehm discussing Making Award Winning Beer with Malt Extract (which is something I believe in wholeheartedly) and a pair of hops presentations from Kelly Harper (Deschutes Brewing) and Ted Hausotter (Hop Heaven). Some serious sour knowledge was dropped by some folks who really know something about funk: Ben Edmunds (Breakside), Sean Burke (The Commons), and Shilpi Halemane (Logsdon Farmhouse Ales). The evening was capped by the well-attended Pro Night that featured spectacular beers from some of the best PNW breweries. It was a great opportunity to try some unique brews from your favorite breweries and become familiar with some smaller or out-of-state breweries with which you may not have been acquainted. Honestly, after all that fun Friday night, Saturday morning got off to a mild start. The presenters were off and running by 8:30am, but it seemed that Pro Night created a little (ahem) collateral damage in terms of attendance for the early sessions. Those who skipped the early sessions in favor of sunglasses and Advil missed out on some choice knowledge. Last night was mad nice. I got my day started with a perfect session to ease into in a full day, a presentation on Berliner Weisse (with beer!) from Imperial Yeast’s Jess Caudill. The session featured an historic perspective on the style, as well as modern techniques that are working to preserve this quirky, sour German ale. The session featured beer samples using both quick and long souring techniques for attendees’ comparison and contrast. I doubt anyone walked out of that session without having learned quite a bit about brewing Berliner Weisse, and if they did, they walked out having tried some quality sessionable sours to start the day off right. Most seminars were followed by a brief break with snacks and a visit to the vendor floor. The goodies were on point, featuring grain samples from craft maltsters like Joseph's Grainery and Skagit Valley Malting, hops from Yakima Valley Hops and yeast from Imperial Yeast (who collaborated with Bader Beer and Wine Supply to create a special blend available to attendees who redeem a voucher at Bader's excellent homebrew shop in Vancouver). And, once again, nearly every booth was pouring fantastic beer showcasing their wares. 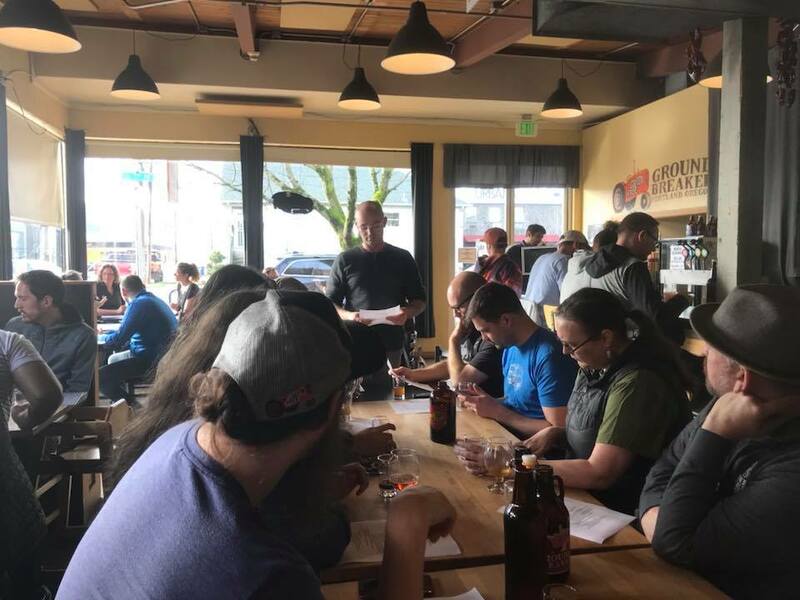 Lunch on Saturday featured some delicious food and beer, but the real treat were dual keynote speeches by American Homebrewers Association Director Gary Glass and Portland craft beer legend Art Larrance. Art Larrance spinning tales of the origin of craft brew in Portland. Gary Glass spoke on the State of Homebrewing in America. He called specific attention to the fact that we now have 1.2 million estimated homebrewers actively brewing in the US. And though that number is substantial, he said that an estimated 19 million craft brew enthusiasts have expressed interest in brewing beer. That is a staggering number and converting even a fraction of those drinkers into brewers would have a huge impact on the hobby. Art Larrance gave an amazing history of craft beer's roots in Portland. He was there in the middle of it all with Portland Brewing Co and the stories he told of himself, the Widmer Brothers, the Ponzi’s (BridgePort) and their contemporaries were some real inside baseball that only he and a few others could tell. It really is the stuff of legend and he puts enormous perspective on how we have gotten to where we are today. He then transitioned to his founding of Cascade Brewing and it’s role in bringing sour beer to the Pacific Northwest and really, the US in general. He is a hilarious guy and his self-effacing nature made for a very special moment in the day’s proceedings. Art can tell a story, and when he does, it’s best to sit back and listen. Art wasn’t the only guy bringing old school cred to the event. Mike “Tasty” McDole and Denny Conn were in attendance both as participants and presenters. Tasty has over 20 years of homebrewing experience and is a popular podcast host on The Brewing Network. His recipes have been brewed commercially and his homebrew recipe for Janet’s Brown Ale has been brewed by innumerable homebrewers, winning countless awards. Also a popular podcaster as well as author, Denny Conn gave his presentation Saturday, 19 years to the day of his first ever batch of homebrew. He has now exceeded 500 batches and shows no sign of slowing. Both of these guys have been instrumental in popularizing the hobby of homebrewing and having them as presenters was a credit to the event. But the fun thing for me was seeing them in attendance in the seminars with everyone else. It shows that even at the top of the hobby, you never stop learning and perfecting your craft. by treating us to a song-filled seminar on brewing like an All-Star. It was great to catch up with two of the subjects from our Growing Local Beer series. Both Owen Lingley (Imperial Yeast) and Seth Klann (Mecca Grade Estate Malt) were on hand as presenters. Both provided tremendous insight to their respective products. It is a tremendous benefit to a brewer to learn about the products they use from the people who produce them. You aren’t going to get better information about your yeast than asking the guy who oversees growing it from a single cell. You aren’t going to get better answers about craft malt than by asking the guy who planted the seed, grew it, harvested it and malted it himself. Cheers to PNWHC for assembling that level of expertise under one roof. The real fun and camaraderie was on full display after dinner at Club Night. Nineteen brew clubs from across the Pacific Northwest went all-out trying to impress with both their beer and some truly amazing booth displays. There were far too many beers pouring for any one human to try responsibly. Many of the beers pouring were truly at commercial-level quality in every aspect. Many more were wildly innovative in their conception (Looking for beers brewed with Quinoa? Oak leaves and carrots? Figs and brettanomyces? Sure, why the hell not? It’s Club night). I had some truly impressive beers. Spokane's IBU had a Gin Barrel IPA that I made at least 6 people try, every one of them was impressed. The two Flanders Reds I tried (One from Cascade Brewers Society and another brewed by members of my home club PDX Brewers) were phenomenal classic examples of a truly difficult style to perfect. The homebrew clubs didn't hold back at all with their displays, nor with their beer. One of the unique aspects of Club Night is the ability to share your beer with people who know and love beer in a non-competitive environment. The feedback is phenomenal. I overheard so many people talking with brewers about their process while drinking one another's beer. Brewers were able to put their beer in the hand of the Director of the AHA and say “Hey, what do you think?” and get an honest answer. At one point Tasty McDole was drinking my beer, asking me about the lager process I used, which is the process I had learned from him on his podcast years ago. I just don’t know many other places you get these kind of opportunities. The author (Font row, second from left) with his homebrew club, PDX Brewers. I think that is the biggest takeaway from the PNWHC. Unless you have the means to chase the National Homebrewers Conference (now Homebrew Con) around the country on an annual basis, you really aren’t going to find a situation like the event PNWHC holds. And they bring it to your backyard. Though it is smaller in scale than Homebrew Con, the knowledge, experience and the beer on hand rival any other conference out there. And who knows? Maybe we will see something the size and scale of Homebrew Con hit the area in the near future? I think PNWHC has proven this area is ready to host that event for the first time since 1998 and I hope others saw the same. Something is Brewing in the 'Couve and #pdxbeergeeks is Bringing it to You! 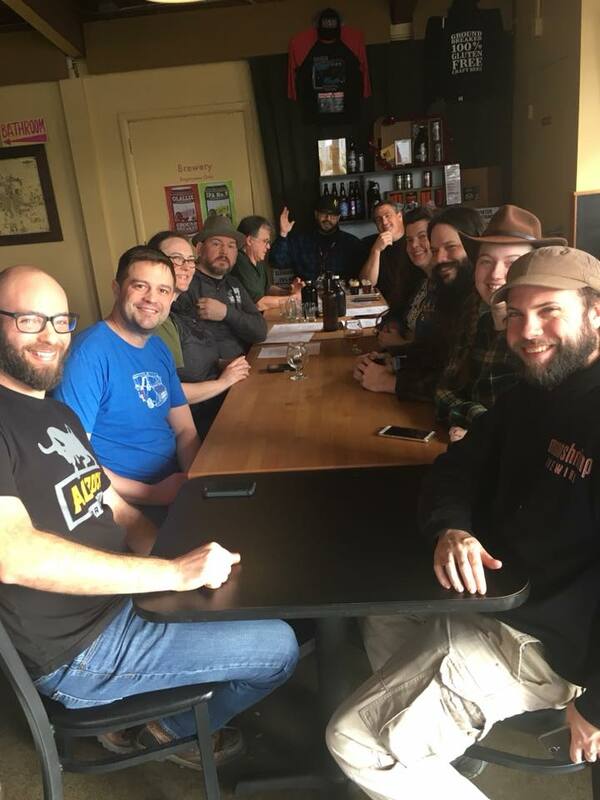 The Second Annual Pacific Northwest Homebrewers Conference is coming to Vancouver WA March 16th and 17th and #pdxbeergeeks will be sending frequent contributor and avid homebrewer Joe Morris to cover the festivities and it promises to be a blast. 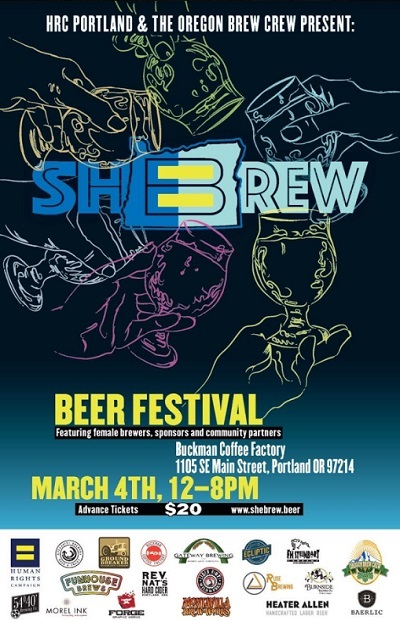 PORTLAND, Ore. - The SheBrew Beer Festival returns for a third year after taking a hiatus in 2016, expanding the event to include an AHA-sanctioned homebrew competition for women brewers, locally and nationally. 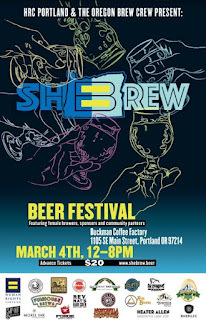 The festival, a joint event from HRC Portland and the Oregon Brew Crew, will take place Saturday, March 4 from 12 to 8pm at Buckman Coffee Factory, located at 1105 SE Main St. It was an absolute blast visiting our local growers for the Growing Local Beer series. And I'd like to extend an enormous "Thank you" to Crosby Hop Farm, Imperial Organic Yeast, and Mecca Grade Estate Malt. Each of our featured subjects extended amazing generosity and were very free with their time. The truly great thing about the craft beer and brewing communities is the willingness of everyone to teach and learn about making better beer. 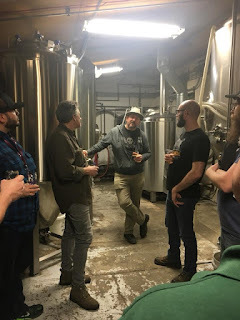 While the Growing Local Beer project was underway, I offered our growers the opportunity to participate in a product demonstration to be featured on #pdxbeergeeks as well as my homebrew blog, Portland Ale Blazer.